A diver writes down observations of marine species in the Dry Tortugas National Park, a cluster of seven islands, composed of coral reefs and sand. You don't have to be a marine biologist to understand the importance of corals  just ask any diver. The tiny underwater creatures are the architects of the beautiful, electric-colored coral reefs that lie in shallow tropical waters around the world. Divers swarm to them not merely for their intrinsic beauty, but because the reefs play host to a wealth of biodiversity unlike anywhere else in the underwater world. Coral reefs are home to more than 25% of total marine species. Take out the corals, and there are no reefs  remove the reefs, and entire ecosystems collapse. Unfortunately, that's exactly what appears to be happening around the world. According to a comprehensive survey by the Global Marine Species Assessment (GMSA) published Thursday in Science, one-third of the more than 700 species of reef-building corals are threatened with extinction. Compare that to a decade ago, when only 2% of corals were endangered. Using criteria established by the International Union for the Conservation of Nature  a group that publishes an annual Red List of threatened animals  that makes corals the most endangered species on the Earth. The assessment's results, presented at the annual International Coral Reef Symposium in Fort Lauderdale, come just a week after the National Oceanic and Atmospheric Administration (NOAA) announced that more than half of the coral reef ecosystems in U.S. territory are in fair or poor condition. 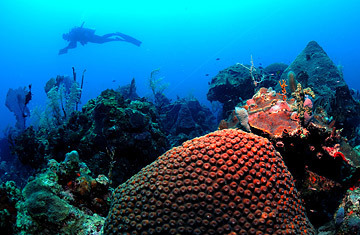 "We're losing the coral in the coral reef," said William Platt, a coral reef expert with NOAA. The causes of the coral's demise are manifold, but they all come back to one culprit: us. Overfishing  especially the kind that uses dynamite or poison to kill whole schools of fish  destroys the coral directly, while polluted runoff from agriculture simply chokes them. Development in booming coastal economies from the Caribbean to Southeast Asia further threaten the delicate reefs. Tourism  in the form of diving and snorkeling  can also cause damage. As with so many other endangered species around the world, there doesn't seem to be enough space for healthy coral reefs and unchecked human development. "It's just a litany of bad actions," says Brian Huse, the executive director of the Coral Reef Alliance. "Over the past 35 to 50 years, we've lost 25% of our reefs worldwide. Put it altogether, and you can see why." Disease plays a role as well, with whole coral colonies wiped out by sudden sickness. That rise in illness may be linked to warmer sea temperatures, which is caused by climate change. And it's global warming that poses the most serious threat to the survival of coral. Corals have a symbiotic relationship with a kind of algae that provide nutrients and energy through photosynthesis  not to mention the vivid colors we associate with coral reefs. When corals are stressed by rising temperatures, the algae are expelled by the coral, turning the reefs bone white. That's a "bleaching event," and bleached coral are left weakened and defenseless against disease. Increased carbon dioxide concentrations in the atmosphere also lead to more acidic seas, which impairs the ability of corals to form their skeletal reefs. (In acidic water, the reefs simply dissolve.) "Corals appear to be particularly sensitive to the buildup of CO2," says Kent Carpenter, the lead author of the Science study and the director of GMSA. "The corals will be the canary in the coal mine in terms of the effect climate change will have on our oceans." In one way, protecting the coral is not that different from protecting any endangered species. First, we need to cut back on activities that ruin their habitat, the shallow waters close to our coast. Agricultural runoff  already responsible for the oceanic "dead zones" seen in the Gulf of Mexico and other heavily built up coasts  has to be curtailed, as does the senselessly destructive fishing practices that have us tossing dynamite or poison into the waters. One of the best strategies is to expand the range of territory protected by marine reserves  national parks of the deep. And here the Bush Administration  usually anything but environmental  deserves real credit. With a stroke of a pen in 2006, President George W. Bush created the Papahanaumokuakea Marine National Monument, a 140,000 sq. mi. protected area northwest of Hawaii. Larger than every other national park in the U.S. combined, the monument protects 10% of the shallow coral reef habitat in U.S. territory. These kind of reserves need to be expanded, to limit the influence of human activity on delicate corals. But we could make the entire ocean into a marine park and still lose the coral, if we can't stop climate change. As temperatures rise in the ocean, bleaching events will become more and more common. According to a study published in Science late last year, if CO2 levels continue rising unabated, by 2100 coral could be utterly extinct. "If we can't contain the CO2 problem and enact strong coral reef conservation measures, we will lose them," says Carpenter. The depressing fate of the coral could be a reminder that climate change has the power to undo all the work of wildlife conservation over the past century  if we let it.